Editor’s note: Elizabeth Ferris is the co-director of the Brookings-LSE Project on Internal Displacement and a senior fellow in Foreign Policy at the Brookings Institution. Vittoria Federici is a senior research assistant at the Brookings Doha Center. The views expressed are their own. In a scene reminiscent of Iraq’s 2006-2008 displacement crisis, hundreds of thousands of Iraqis are again fleeing violent conflict for perceived safer areas. Indeed, more than 1.2 million Iraqis have been displaced since fighting erupted in Anbar Province between Sunni insurgents and the Iraqi army at the start of this year, a situation dramatically worsened by the lightning advances of the Islamic State of Iraq and Syria (ISIS). Sadly, this mass displacement looks like it will be even more complicated than the previous one. For a start, ISIS fighters have quickly and brutally taken over large swathes of territory in order to establish an Islamic Caliphate straddling Syria and Iraq. Taking advantage of widespread discontent among the local Sunni population, the group is fighting an open sectarian war against the Shia-led government in Baghdad. As it consolidates its powerbase, ISIS is demanding that Muslims pledge allegiance to its movement, live according to its harsh interpretation of Islam, and wage international jihad. Iraqi security forces are responding with a fierce military offensive aimed both at defending Baghdad and regaining control of Mosul and Tikrit. But the escalation in violence – open fighting, insecurity, and numerous road blockades – means that national and international humanitarian agencies can’t reach those in need. With key land routes to the south now controlled by militants, more than 300,000 Iraqis from Ninewa, Diyala, and Salah al-Din Provinces have sought refuge in neighboring Kurdistan. While this number includes many Sunni Arabs – usually government loyalists – a large portion of internally displaced persons (IDPs) in the Kurdish region belong to the various ethnic and religious minorities of northern Iraq: Christians, Shia Turkmen, Shabak, Yazidis. Most minorities are now dreading returning to their communities now that ISIS has launched what amounts to an ethnic cleansing campaign. In the towns of Tal Afar and Bashir, for example, the group is reported to have executed minorities, destroyed Shiite places of worship, looted homes, as well as raped and imposed forced marriages on women. The reality is that the present crisis simply compounds earlier waves of displacement, both within Iraq and in the region. More than one million Iraqis displaced by violence in 2006-08 have yet to find lasting solutions. Repeated crises have created layers of displacement within Iraq: the concerns of 220, 000 Syrian refugees are compounded by the tens of thousands of Iraqi refugees in Syria who have recently returned home. Even among more recent IDPs, over 80 percent of those surveyed said they have been forced to flee more than once. These layers of displacement complicate solutions in the wider region. The Middle East has a long history of displacement, but although hundreds of thousands of Iraqis have in the past managed to flee to neighboring countries, few Iraqis are now likely to seek safety in war-shattered Syria, while Jordan is overwhelmed with refugees. Even within Iraqi Kurdistan, authorities have started to impose tight security restrictions at checkpoints with the Iraqi central state. Only families, or those with a resident sponsor, are allowed to cross into Kurdish territory – usually with a seven-day residency permit. Many single men are being turned away or even struggling to enter the region in order to fly south to Basra out of Erbil airport. A final difference with earlier displacement is simply that the domestic and international situations have changed. In mid-June, following the withdrawal of the Iraqi army, Kurdish Peshmerga forces took control over the disputed city of Kirkuk and wide areas in Diyala and Mosul, expanding Kurdish territory by as much as 40 percent, and Kurdish President Massoud Barzani is now calling for a referendum on the independence of these regions from Baghdad. While the Peshmerga are doing what they can to protect civilians from jihadi attacks, the populations in these contested areas are often cut off from basic services and assistance. The central government has pledged to provide 300,000 Iraqi dinars ($250) for displaced families for the next six months. But with Kurdistan and Iraq’s central government at a political standoff – over oil exports, the payment of salaries, and now the future of Kirkuk – it’s unlikely that this support will materialize anytime soon. At the international level, the displacement of a million people in a few months would normally trigger an all-hands-on deck emergency response. But with the ongoing situations in Syria, South Sudan and the Central African Republic, to name a few, the international humanitarian system is reeling. Even as the United Nations was appealing for $312 million to support the newly displaced in Iraq, it was issuing a new appeal for $3.24 billion for the Syria regional response, despite only a fraction of the original Iraq request having been raised. All this suggests that it is time to look for new solutions. Saudi Arabia’s recent pledge of $500 million should enable the United Nations to do much more to address the present humanitarian crisis and assist the Iraqi government with experienced personnel. But while the Iraqi people are to be commended for their generosity and hospitality, it is clear that even this has limits. Practical support, not just words, is needed to help the country cope with this crisis. Well, the gang is all here today !! Say hello kids !! It is hard to imagine people tolerating such treatment. However, it is also hard to imagine a government, our own, envolving theselves in such a civil war of their creation. Also hard to imagine a more than ten year involvement in Vietnam. From the towers along the coast you could look into the south china sea and watch oil tankers pull up to navy protected oil rigs and fill their tanks. Another thing, just who is running this government? At our base camp at Chu Lai, we were able to sit at the edge of the cliffs overlooking the South China Sea and watch USS New Jersey working out at night. It was quite awesome. I was 80 miles north of cam rahn to start, tuy hoa, on the coast. The New Jersey must have been something to see. Good to see Saudi stepping up to the plate with that 500 mil pledge! Good for you @ Joey? I was referring to THIS story though and its past time for the ME countries to step up and take a role in cleaning up their part of the world instead of expecting the US to always do so! I gave at the office too joey. Yes chrissy. Enough of u.s. cleaning up cow manure. I'm watching Hawaii 5 O. Then cnn news later. Lol @ stuart...Criminal Minds here...reminds me of some bloggers lol. Human right organization – HRW – declared in July 11 that dictator Nouri Malik regime have executed 255 Iraqi Sunni prisoners recently. It's a war criminal!! Indeed, the Middle East has produced the largest number of refugees in recent history. 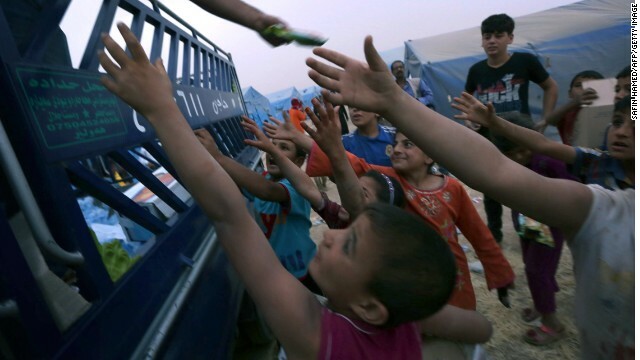 The civil war in Syria and the sectarian strife in Iraq have taken a toll on the civilians. Those who can, flee. Those who stay behind, live under constant fear or – as in many areas in Syria – under siege. The fact is that a foreign intervention in Iraq wouldn't stop the influx of IDPs crossing borders. Outsiders can only help as good as they can on humanitarian front.